T he apostle Peter summarizes the Bible’s teaching on respect in his first Epistle. My mission is clear. This passage encompasses four major areas of our lives, teaching me that, as a follower of the Messiah, I should respect all men, the disciples, God, and governmental authorities. The word respect is a translation of the Greek word timēsate, meaning “honor or value.” It literally means “to place a great value or high price on something.” Interestingly, today we tend to place our values on our personal rights and the equality of man. That is the goal given to me by God. 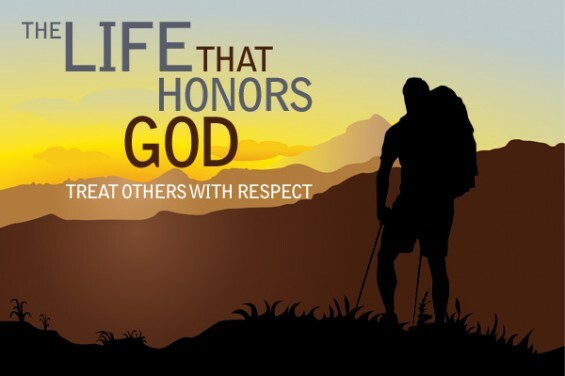 Respect for God leads to godly living. Biblical respect is different. It is more about a perceived inequality in that we recognize that some things and some people are more important than I am. Philippians 2:3 — Do nothing from selfishness or empty conceit through factional motives, or strife, but with an attitude of humility being neither arrogant nor self-righteous regard others as more important than yourselves. 2 Chronicles 6:30–31 — then hear from heaven Your dwelling place, and forgive, and render to each according to all his ways, whose heart You know for You alone know the hearts of the sons of men, that they may fear You, to walk in Your ways as long as they live in the land which You have given to our fathers. Proverbs 16:6 — By lovingkindness and truth iniquity is atoned for, And by the fear of the Master one keeps away from evil. Hebrews 11:7 — By faith Noah, being warned by God about things not yet seen, in reverence prepared an ark for the salvation of his household, by which he condemned the world, and became an heir of the righteousness which is according to faith. 1 Peter 1:14–17 — As obedient children, do not be conformed to the former lusts which were yours in your ignorance, but like the Holy One who called you, be holy yourselves also in all your behavior; because it is written, “You shall be holy, for I am holy.” If you address as Father the One who impartially judges according to each one’s work, conduct yourselves in fear during the time of your stay on earth.